Warm up with a cozy bowl of soup you can snuggle with tonight, and get ahead at the same time with a stuffed mushroom appetizer you can tuck into the freezer, ready to go for Thanksgiving. For tonight, it’s Sausage, White Bean, and Kale soup. 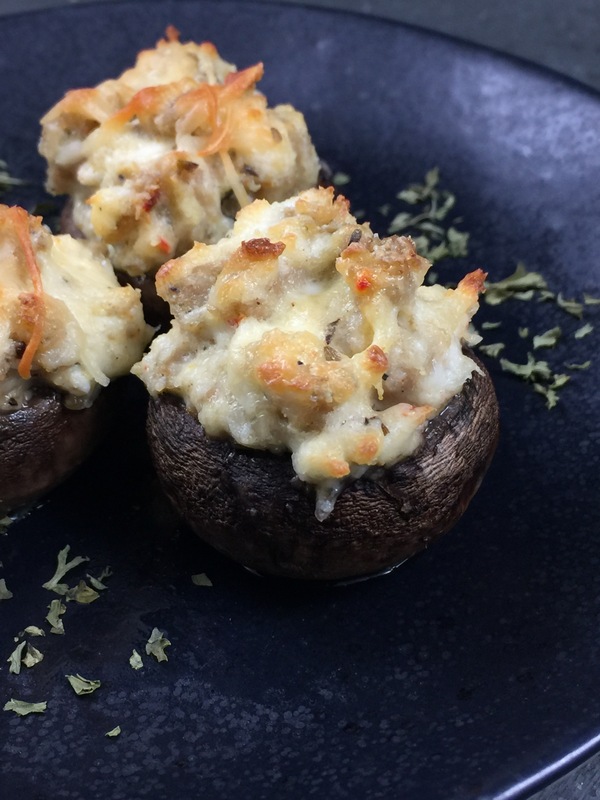 For later, Sausage-stuffed Mushrooms, a warm, savory appetizer – perfect for any time during the holidays, but especially nice to kick off Thanksgiving dinner. These two recipes are from previous posts, but I am reposting them again because they are two of my favorite recipes, and… they are also easy to make at the same time. Here’s how to do it. Brown three 16 ounce rolls of Isernio’s Italian chicken sausage in a large dutch oven. Transfer 2/3 of the fully cooked sausage to a bowl. To the 1/3 browned sausage remaining in dutch oven, add garlic, and continue to follow the directions (after add garlic) below. Heat oil in a large stockpot or Dutch oven over medium heat. Add sausage and cook until lightly brown, breaking up large pieces with a spoon as it cooks. Add garlic and cook until golden, a few minutes more, continuing to stir. Add the beans, chicken base, water, and diced tomatoes. Bring to a boil and add kale. Reduce heat and continue to cook and stir, simmering until kale has softened. Season with freshly ground black pepper. 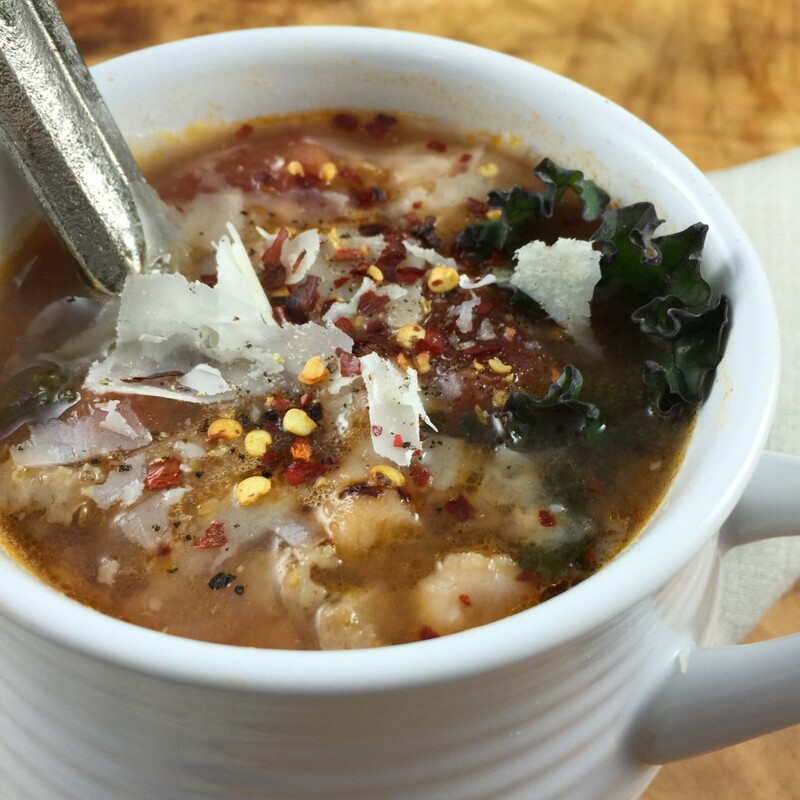 Ladle into bowls, topping with shaved cheese, red pepper flakes, and a generous grind of black pepper. While the soup is simmering, finish the mushroom filling. To the bowl of browned sausage, add oregano, then continue through the rest of the instructions for the Sausage-stuffed mushrooms. This time, I prepped my mushrooms, filled them, and froze them stuffed. You can also freeze the stuffing and fill them on Wednesday before Thanksgiving, which is what I usually do. In this case, divide the filling into 2 zip-top bags. You will transfer one to the refrigerator Tuesday night to thaw. Wednesday you can rinse, stem, and stuff the mushrooms, or enlist one of your holiday helpers to pitch in. Make sure the dish or sheet pan you use will fit in your toaster oven. (Made that mistake one year!) You will have more than enough filling for 24 mushrooms. I always buy more and make more. If there are any left, they reheat great the next day. Keep the other bag in your freezer, ready to go for New Year’s. Brush baking sheet, or dish, with olive oil to coat. Brush cavity of each mushroom cap with white wine. Fill with sausage mixture and arrange, filling side up, in prepared dish. Sprinkle with some of remaining shredded Parmesan cheese. Cover and chill. Preheat oven to 350º. Bake uncovered until mushrooms are tender and filling is brown on top, about 25 minutes. Note: I wanted to keep the quantities accurate for a double batch, but know that you will not use all the shredded cheese when you make this for Thanksgiving, and you will need some to sprinkle on top of the ones you make for New Year’s. You will use only 1/3 cup of the white wine at Thanksgiving, and you will, of course, have to buy more mushrooms to stuff for New Year’s.